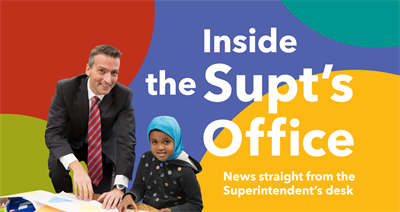 Inside the Supt's Office is a monthly publication with news straight from the desk of Superintendent Ed Graff. The publication will preview themes, issues and events for the month ahead, and focus on our district’s four priorities: equity, literacy, multi-tiered systems of support, and social emotional learning. Teacher (tee-cher) n. 1) Provider of knowledge and insight. 2) Mentor. 3) One who inspires, motivates and opens up minds to the endless possibilities of which one can achieve. 4) One who makes a positive difference in the lives of many. 5) One who is admired, appreciated and held in the highest esteem. Nearly three weeks later, our hearts continue to grieve for the Parkland, Florida, community and the families who lost loved ones in the tragic school shooting at Marjory Stoneman Douglas High School. The shooting there and a general increase in threats of school violence have impacted people throughout our country. While we have policies in place to keep our students as safe as possible, many people are wondering what else can be done. Across the nation and here in Minneapolis, students have been especially active in speaking out on this issue, and they have organized a number of activities in response. Tonight we’re hosting the third of four community budget dialogues to more broadly share information about our projected $33 million deficit and our systemic recommendations to close the gap. My hope is that the sessions will help us garner ideas for additional cost-savings, and introduce other ways for families and community members to get involved in the budget process. I also hope many of you will take the opportunity to learn more by coming to the meeting tonight or next Tuesday at the Wilder Complex, or view the online meeting presentation.